OTTAWA - A familiar face will be returning to the Ottawa Champions in 2019. He had already been on the roster in 2017, when he served as the team's pitching coach. Champions manager Sebastien Boucher states Aumont will also take on his old coaching role in the new season. 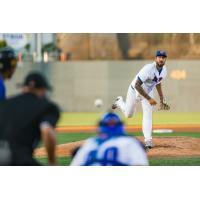 Aumont's baseball pedigree includes a four-year stint as a member of the MLB's Philadelphia Phillies, and appearances with the Canadian men's national team at prestigious international tournaments. In the majors, Aumont spent his 46 Phillies appearances primarily as a reliever - he made one start during his career. During those four years in Philadelphia, he amassed a 6.80 ERA, 53 hits and 33 earned runs over 43.2 innings. Aumont's big league time ended in 2014, and from there he bounced around Charlotte (AAA ChiSox) and Buffalo (AAA Toronto) before landing as a member of the Champions in 2017. He served as Ottawa's pitching coach as a midseason replacement, and ended the season with a 5-8 record and 128 hits over 115.2 innings. The veteran proved to be a reliable option in the rotation, finishing third in innings pitched on the 2017 Champions, and second in strikeouts (103).